Truckee Mountain Vacation Rentals first opened its doors in November of 1994, with only twelve houses on the program. Through the years TMVR has accumulated over one hundred and fifty homes, keeping their business small in order to better serve both the owners and renters. TMVR’s goal is to find our guests a relaxing, comfortable living space that best fits their vacation needs. Truckee Mountain Vacation Rentals specializes in short summer/winter homes, ski-leases, and long term homes. Our homes vary from small two bedroom condos to four bedroom homes that sleep up to fourteen people. 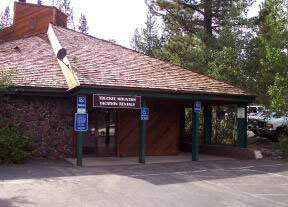 Most of our homes are located in Tahoe Donner where guests can take advantage of its many amenities. The TMVR staff has personal knowledge of each property and pride themselves in being able to answer most of the questions asked. Truckee Mountain Vacation Rentals finds homes to fit the needs of everyone; we have homes to fit every budget and taste. Why not? Truckee is known for its beauty. Nothing but fresh air, bright stars, and beautiful scenery. Truckee is located in the middle of several ski hills, golf courses, and lakes. It is 35 miles from gambling and minutes from a variety of beautiful hikes and relaxing beaches. Truckee is the place to get away from it all. Let us help you plan that perfect vacation.